Reed Sensor Market size was valued at over USD 1 billion in 2017, growing at a CAGR of 7% from 2018 to 2024. The global shipments are forecast to reach over 3 billion units by 2024. 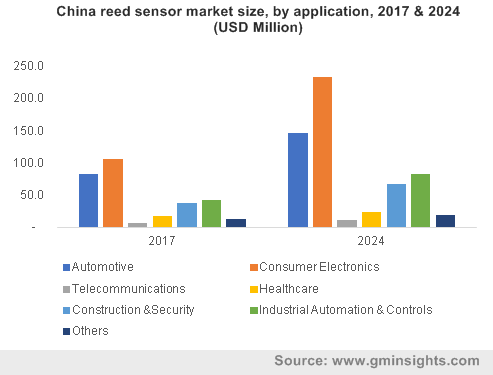 Growing demand for advanced sensor technology across several industries such as medical, military & aerospace, security and safety, telecommunications, transportation, and utilities & smart grid is driving the reed sensor market. These industries use reed sensors for numerous applications including sensing and detecting movement, metal detection, proximity sensing, liquid level, and flow measurement. The components require low power consumption, making them useful for a number of battery-operated applications and are available in power ratings of up to 100W in different sizes. Electrical equipment manufacturers are using these components actively due to their simpler design and low cost. The growing smart home market in developed nations, such as the U.S., is projected to augment the reed sensor market. Nowadays, home systems can be remotely controlled via mobile devices to check if the doors are closed and to turn off or turn on lights, etc. All these applications require magnetic technology for operation. These sensors are used in manufacturing facilities for liquid flow and level monitoring, machinery ignition systems, visual indications, etc., as they work efficiently in extreme environments, propelling the market for industrial controls. Factors such as the large size of these components, lower durability, and competition from Hall-effect technology as a result of advancements in magnetic resonance technologies are limiting the growth of the reed sensors market. The large size of these components makes it difficult for manufacturers to offer miniaturization of devices, limiting their integration into new applications. The dry reed sensor market is expected to witness a growth of over 9.5% from 2018 to 2024. This is due to the growing transition of manufacturers to adopt dry switching technology over mercury-wetted. This shift is driven by rising environmental concerns regarding the use of mercury. Though mercury-wetted provides more consistent contact resistance, the growing use of mercury in electronic components is being regulated by countries all over the world in consideration of the Minamata Convention. Many countries have signed the treaty that obligates them to ban the import, export, and production of products containing mercury. Mercury wetted switches are expected to phase out by 2020. According to the UNEP, Japan, Switzerland, and the European Union have committed USD 10 billion to help the developing nations to phase out mercury from Earth. Companies such as Littelfuse have stopped producing mercury wetted reed switches due to environmental concerns. The extensive applications of the reed sensor market in all types of equipment have made manufacturers to produce them in hundreds of different sizes and shapes to meet a multitude of requirements. The products are available in contact forms A, B, C, D, and E with power ratings up to 100W. These sensors exhibit exceptional performance in long operating life applications with a life expectancy up to 1 billion operations as they do not drain power in non-operational mode. The most widely used reed sensors are of the type Form A due to their relatively smaller size than other switching technologies. Form A sensors are widely manufactured due to their ability to provide more miniaturized portable devices. Form C is expected to grow at a CAGR of over 8% in the market owing to the increasing use in relays that require closed SPST device. The Form C sensors can also be used as Form B and are suitable for several applications in different markets including machine control, alarm &security, test & measurement, and control elements. The automotive industry held a majority revenue share of nearly 30% in 2017. The globally flourishing automotive sector is one of the major propellers of the reed sensor market. There is a significant demand for these products in automotive systems for relays, entertainment, communication, and safety. These components serve a plethora of applications including seatbelt locking, anti-theft alarm, power windows, door-latch sensing, coolant flow sensing, speed sensing, seatbelt lock sensing, inclination sensing, etc. The growing electric vehicles market globally has created further opportunities for reed sensors market growth. Over 1 million electric vehicle sales are estimated to have taken place during the second half of 2017. Electric vehicle sales have witnessed an upsurge in countries including China, Canada, the U.S., and Denmark. Reed sensors are being used in electric car chargers to minimize the time needed for charging the vehicle. Moreover, they are being installed in electric cars in charging sockets and a magnet is available at the end of the charging cable. The use of these sensors creates an accurate locking signal on the charging circuit, making them vital for electric vehicles. 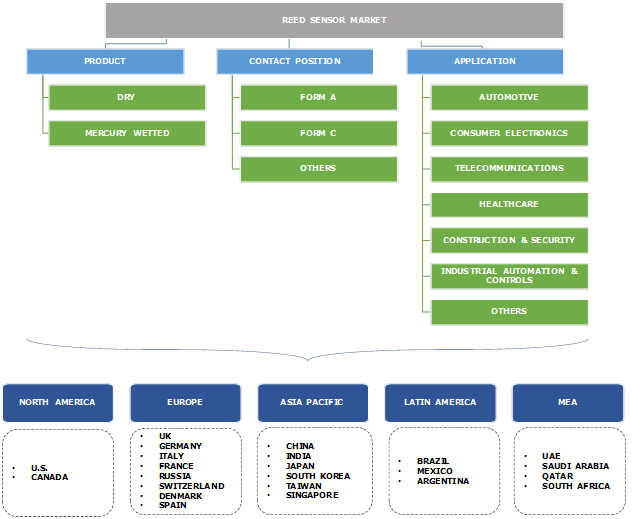 The Asia Pacific reed sensor market holds the largest market share owing to the increasing demand from countries including South Korea, China, and Japan. China being a major market for electric vehicles, home electronics contribute toward the significant demand for reed sensors. Technological advancements across several industries in China and the growing industrial equipment market are driving the industry growth. The U.S. reed sensor market was valued at over USD 350 million in 2017 and is projected to be driven by the automotive industry and the growing utilization of these components in smart home appliances. A huge adoption of smart homes, automated security systems, voice-controlled thermostats, and mood lights in the U.S. will further drive the U.S. industry. Moreover, the U.S. is witnessing a high demand for the components in passenger automotive systems such as GPS, liquid level sensors, power windows, etc. Major companies in the reed sensor market are Littelfuse, Standex-Meder Electronics, HIS Sensing, RMCIP, and Nippon Aleph. Standex-Meder has strengthened its position in Asian markets in the industry after the acquisition of OKI Sensor Device in April 2017. Companies in the market are offering customized solutions, catering to different requirements of several industries. They are also strengthening their distribution network for tapping the potential opportunities. For instance, in November 2016, PIC GmbH entered into a collaboration with World Micro, Inc., an Atlanta-based electronic distribution company. This strategic alliance will enable PIC GmbH to expand its customer base as it provides World Micro the rights to promote, distribute, and market PIC GmbH's line of reed switches and sensors. The reed sensor market is witnessing a demand in a variety of applications for a very long time. Manufacturers extensively use these components in various equipment due to their reliable performance and simpler design. The growing demand for battery-operated portable consumer electronics has been one of the major factors for the growth of the market. These components are deployed in automatic meter reading systems such as in water and gas meters as low power consumption is a key parameter of their design in these systems. With the growing popularity of connected devices, the industry is projected to witness a positive demand across the smart home and utilities and emerging IoT industry. The reed sensors industry is facing extreme competition from Hall-effect sensors as they can be manufactured in much more smaller packages. However, there are still several applications where reed sensors are preferred as hall-effect technology does not meet the high sensitivity and extremely low-power requirements needed for many battery-operated devices.